I have been reading Garr Reynold's Presentation Zen blog even before the first book came out. Getting Presentation Zen (The Book) was just the next logical step, since it provides all that useful information you can find on the website in a structured, readable, and easily accessible way. Four years and another two books (Presentation Zen Design and The Naked Presenter) later, there is now a second edition of the original Presentation Zen book. What can we expect from it? It's somewhat ironic that the first testimonial in the book states that it's often the slim books that have the most impact when the second edition of Presentation Zen is noticeably thicker than the first. 60 additional pages or 25% more, to be exact. On closer inspection, the Delivery section has gained an additional chapter, The Need for Engagement, which accounts for about half of the additional pages. The rest are distributed over the other chapters, some of which gained a few more pages that way. Most of those changes are subtle and you often won't notice them unless you compare both editions side by side. References to iPads and Prezi (both of which only came out after the first edition) or photos from TEDxTokyo 2011 are also signs of a discreet update. You'll also find content that Garr published on the Presentation Zen blog this year, e.g. from this article on the power of faces. The Need for Engagement, the new chapter, picks up some thoughts from The Naked Presenter, Garr's third book. In fact, it very much resembles chapter 4, Engage with Passion, Proximity, and Play from that book in that it talks about emotions, mirror neurons, and the need to remove barriers. It's not a straight copy, though, but the same ideas re-explained. Obviously, this second edition of Presentation Zen is not a radical rewrite but a careful update. Things have been made clearer or explained in more detail where necessary, new content has carefully been injected where appropriate. If you know the first edition, it still feels like the same book and you're only left wondering if some specific nugget is really new or if you've overlooked it the last time you read the book. I seem to remember Garr stating that It's the same book, only better or words to that effect. That about sums it up. 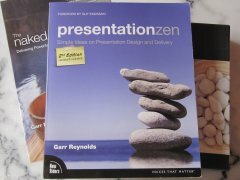 All subtle and more obvious changes aside, Presentation Zen is still the book to read on modern presentation design and delivery. Presentation Zen is an approach, not a method or blueprint that you have to follow slavishly. The idea is to create and deliver the best possible presentation for your specific audience. And while that obviously means more work in preparation, Garr provides the encouragement that it's worth it if you want to really reach your audience. The Presentation Zen book contains all that you need to make this happen, backed up with scientific evidence where needed and supported with real-life examples. On top of that, it's easy to read and Garr's passion for his topic and his roots in Zen come across as honest without resorting to superlatives or over-the-top wording that plagues so many nonfiction books by American authors. It's a joy to read and encourages you to give the Presentation Zen approach a try. What more can you expect? What has been true for the first edition is even more so for the second one: If you're only going to buy one book about presentations, this should be it. It will provide you with all the necessary guidance for creating great, effective, and memorable presentations. When I'm working on a new presentation, I often open up the book at a random page and start reading. It always helps to either reinforce an aspect I was already working on or reminds me of something I need to think about. In other words, it's a great source of inspiration, even 4 years after its first publication and after having re-read it (in whole or in parts) numerous times. The second edition feels more "complete" now, by which I mean that the extra pages all add useful information and don't feel bolted on. The only downside, I guess, is that there's less need for buying The Naked Presenter now - but that's Garr's (and his publisher's) problem, not yours ;-) This, I guess, also answers the question what you should do if you already own the first edition. If you already have the first edition and The Naked Presenter, there's probably no need to rush and buy the second edition - unless your copy is beginning to fall apart from heavy use. But if you held back from buying Presentation Zen until now - don't wait any longer. Your audience will be grateful. "Book Review: Presentation Zen" by Dirk Haun is licensed under a Creative Commons Attribution-ShareAlike 4.0 International Licence.